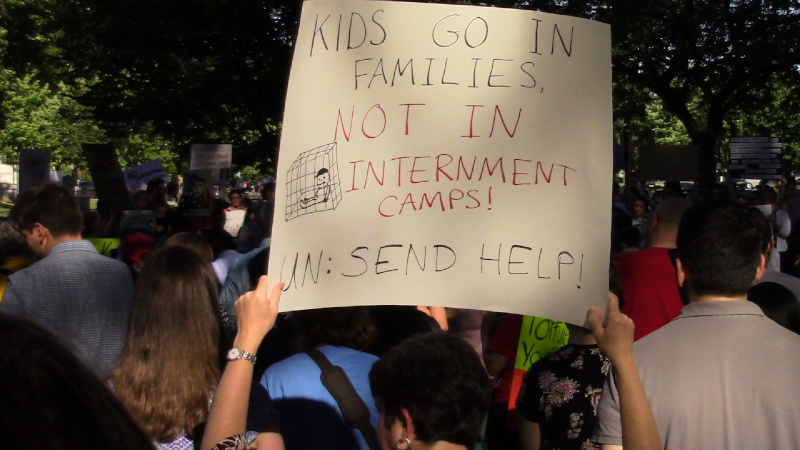 On the 14th of June, migrant rights activists gathered for the "Families Belong Together" protest against the Trump/Sessions policy of separating families at the border. 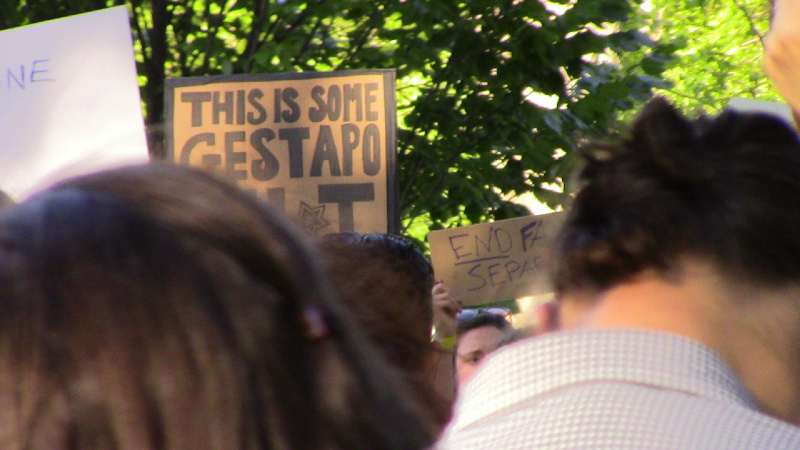 Many of the protesters invoked Nazi Germany and called Trump's policy "evil." Under the new Trump/Session family separation policy, in some cases screaming children are dragged away from their parents and in others parents are told brazen lies to get them away from their children. DHS has admitted the sole purpose of this intentional torture of children is to deter others from crossing the border. This is some all-out, heavy-duty, capital-F Fascism from Trump and his KKK-loving attorney general Jeff Sessions. One Jewish speaker said this was the moment her parents had warned her about and invoked "Never Again!" One of the speakers described two of the prisons being used by CBP to lock up asylum seekers and others who don't fit Trump's unspoken "Make America White Again" campaign promise. One prison was called "the Icebox" (english translation) as it was kept freezing cold. A freezing cold prison near the Rio Grande implies deliberate effort as the climate is normally hot. Migrants still wet from crossing the river have been thrown directly into cold cells, presumably as deliberate punishment. 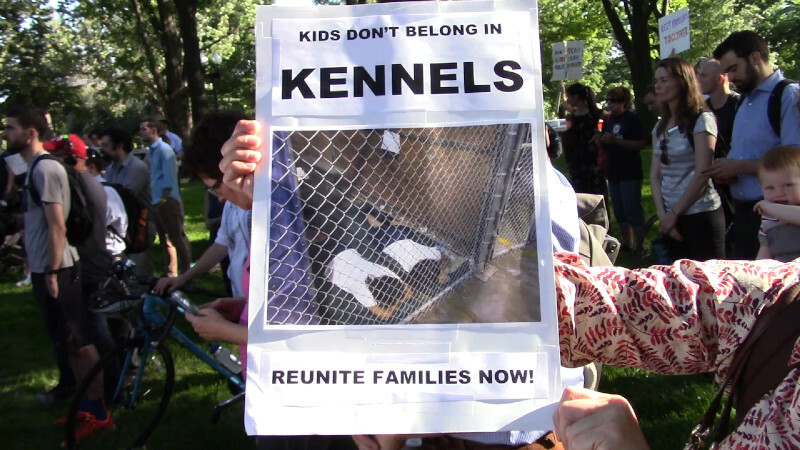 The other was referred to as the "dog pound" because it is constructed like a kennel with similar caged runs. At another point, a speaker described deceptions used by CPB to get parents to let go of their children. Things like false claims of going to court have been used to get parents to walk into a room leaving their children behind, then finding their children gone when they return. Same idea as calling gas chambers "showers" to prevent all-out resistance. 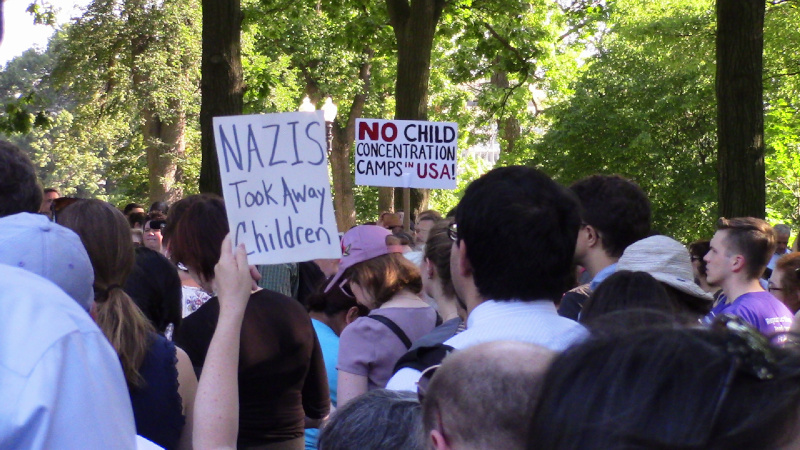 Many time comparisons to Nazi Germany were heard, though the US was actually ahead of the Nazis on this issue. At the turn of the 20th century, the US had the the slogan "Kill the Indian, save the man." The linchpin of the policy was forcibly taking Native American children from their parents, cutting off their hair, and imprisoning them in boarding schools. Speaking Indigneous languages or showing any signs of remembering their culture brought harsh physical punishment. Many children just gave up, and diseases raced through the weakened population of child hostages. At some "schools" the death rate was as high as one in three, mostly from diseases. 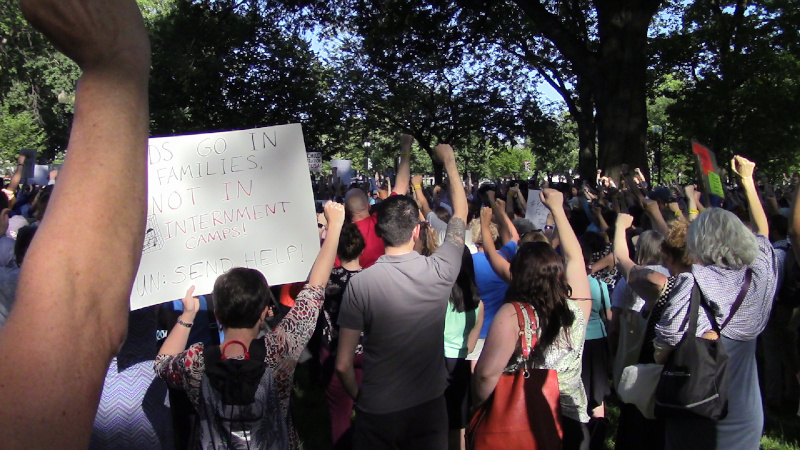 Some at the protest wore yellow armbands in solidarity with detained and separated parents who were fitted with yellow armbands in CPB's private prisons.